VietNamNet Bridge – While pushing his caddie around the streets of Vietnam for three months, Nicolas Queune took the time to observe its landscapes and its people. Queune stands out in the crowd because he always wears a red T-shirt and a straw hat like his favourite comic character named Luffy, from the Japanese popular manga comic, One Piece. 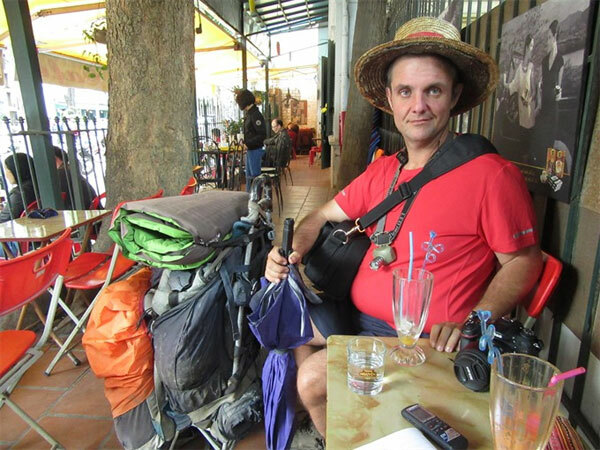 He started his journey on foot around the world in 2013. An avid reader of the popular Japanese manga, which tells about the adventures of the aspiring king of the pirates Luffy, Nicolas decided to reproduce the journey of his hero to give meaning to his life. Although the manga takes place in an imaginary world, the author is inspired by real places. He started his trip five years ago in Asia. He first flew from France to Japan, and from there he walked around New Zealand, Australia, Malaysia, Thailand, Cambodia, and Laos. His adventures will then take him from South East Asia to Europe, then probably to Central America. 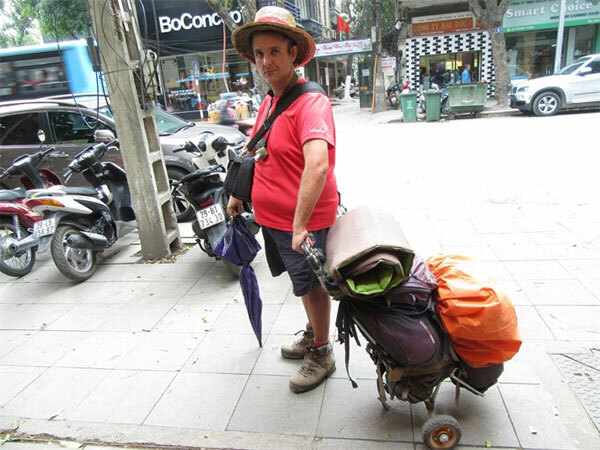 He arrived in Vietnam in March and has been travelling around the country on foot until now. He is currently in the centre of the country. Upon arriving in Vietnam, he began waking from Dien Bien Phu to Lao Cai, from Hanoi to Quang Ninh to see Ha Long Bay, and he’s now in Nha Trang. “In Vietnam, life is not expensive. I can sleep in a guest house for just a few euros,” he says. “In some other countries where life is more expensive, I mostly sleep in a tent, behind a tree, in abandoned houses, or at train stations. “I am very happy to be in Vietnam because Vietnamese people are among the most welcoming people that I’ve met until now,” he says. He hasn’t run into any danger on his journey so far, and he hopes this will continue to be the case. “Here, it is very easy to meet people, they are curious; they invite me to drink tea with them on the sidewalk. I spend lot of evenings with local people. Some invite me to have dinner with them at home. “Vietnamese cuisine is very tasty. I love it,” he says. His walking speed depends on the kinds of roads and on the climate. In cities like Hanoi, he says that he can walk 40 kilometres par day, starting at 8am and finishing at 10pm. Manga manga: Nicolas Queune has travelled around many regions of Vietnam, pushing his caddie, and wears a red T-shirt and a straw hat like his favourite comic character, called Luffy, from the Japanese manga, One Piece. “I spent my days in front of the computer. I spent my spare time playing games. I’ve never had a girlfriend,” he says. One day he found the website www.toutenmarchant.com which tells the story of two French men making a tour around the world by foot. He told himself that he may also do it. And then, after ten days of preparation, he quit his job, took his savings, and started his trip. He weighted 123 kilos at that time. After five years walking, he lost 50 kilos. Nicolas has already travelled more than 8,000km on foot. He tells about his trip in French on a Facebook page (Expedition One Piece Francais) and updates it regularly. He has an increasing number of fans. Recently, his mother, 60, flew from France to join the walking tour with him in Thailand to fulfill her childhood dream. “The trip has changed my life. I met so many interesting people,” she says.